Gateway Psychiatric Services has produced and distributed several newsletters, handling all aspects from planning to printing to mailing, and ensures a smooth process and the successful publication of each issue of each newsletter. For several years Gateway Psychiatric Services produced the newsletter for the American Association for Emergency Psychiatry. 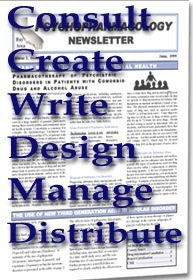 This included editing, designing, distributing and soliciting advertising. The Bay Area Psychopharmacology Newsletter was developed for community psychiatrists in the Bay Area by Gateway Psychiatric Services. Gateway was responsible for convening editorial board meetings, soliciting articles, editing them, designing the newsletter, and distributing it.